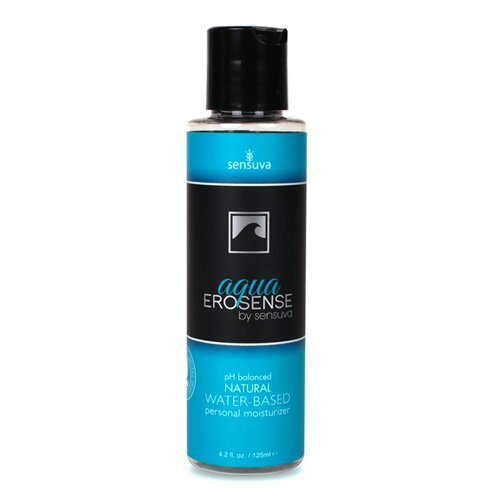 Erosense Aqua is Sensuva's natural water based personal moisturizer. It was important to create a personal moisturizer that felt natural, lasted a long time, and was truly healthy for the body. Aqua feels very similar to someones own personal lubrication. It is especially smooth feeling and hydrating to the skin, and it doesnt create the typical tackiness that most waterbased lubricants seem to have. Aqua is an exceptional water based formula that is made from a blend of healthy ingredients that are natural, organic, food grade, EcoCert and EU certified. Aqua is pH balanced and free of glycerin and parabens. It is ideal for anyone, especially people with sensitivities. Today, there are many choices of what to put in and on your body. The Erosense line of personal moisturizers was created for healthy minded people who want better products for their bodies. Sensuva is known for creating products using the highest quality of ingredients that are always body safe. Each product is specially formulated, and manufactured in our very own in house facility to ensure quality control. Sensuva's mission is to create products for men and women that are genuinely beneficial, and help them live more passionate lives.